The property has its own PRIVATE BOAT RAMP. The Salmon Fly Hatch starts the second week in June. This is a mountain masterpiece located on the Rio Grande. The home has 2 master bedrooms downstairs with King size beds in each of these rooms. A third bedroom upstairs features 2 Queen size beds. The fourth bedroom is the bunk-room and has 3 sets of bunk beds, hence it sleeps 6. The home is brand new and has granite counter-tops in the kitchen, a beautiful rock fireplace, open kitchen/ dining area for entertaining. The views of the river and surrounding mountain are unprecedented. 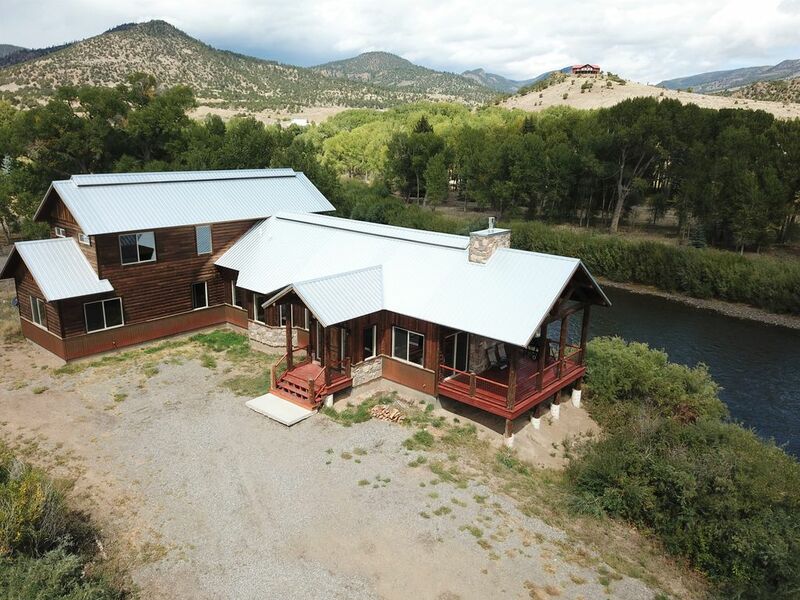 This is an unprecedented property for the South Fork area with the incredible river and mountain views. The are 360 degree mountain views from this property. This stunning home is located on the banks of the Rio Grande. One can enjoy tantalizing river views from within the home and the decks as well. You can kayak from and to this property. Call 8200 Mountain sports to arrange your raft rentals 719-873-1977. You can raft from and to this property. Call 8200 Mountain sports to arrange your raft rentals 719-873-1977. There is a patio table and chairs on the deck over looking the river. Wolf Creek Ski Area is only 20 minutes away and typically has the MOST SNOW IN COLORADO. The Rio Grande Club & Resort is about 5 minutes away. Contact us if you are looking to rent this property for a wedding. We have wedding chairs and can set up the property has a full service wedding location with catering etc. This is our 4th year coming to ski Wolfe creek and this house was BY FAR the best we have had!!! It is very close to Wolfe creek, very clean, tons of room and ABSOLUTELY beautiful!!!! Only issue was the garbage disposal didn’t work which was no big deal considering all the other amazing things!!! Very thankful for the home owners for allowing us to stay there. We will for sure be booking this home every spring break if available!!!!!! Thank you for your feedback. We will have maintenance check the garbage disposal as we were unaware of it not operating. We are happy you enjoyed your stay with us and welcome the opportunity to rent to you in the future. Great location, clean, spacious. A garage and a hot tub would make this place exceptional, but it was still a great place. I would book it again. The house was recently built and it has all modern amenities. Hassle-free experience. Beau, the owner, is great! Beautiful, large cabin on the Rio Grande! This is a well appointed, large, comfortable cabin right on the river. We watched ice dams move down the river on the back deck, saw a bald eagle land in the large tree next to the cabin. The fireplace is awesome for warming cold hands. It is about 30 minutes from great skiing. We had two families equaling 12 people enjoying the space. Two tables allow for everyone to have a place to eat and multiple games to be played. The kitchen is well appointed. Two masters are great for two couples. We had to pick up an overnighted package during the holidays and Beau, the owner graciously met us at his office to get it. We made wonderful memories here! Newer build with open floor plan and plenty of room. New and spacious. Needs minor touch ups. Like most VRBOs, there wasn’t enough toilet paper, paper towels, or any dish soap. Place could be cleaned up some (counter tops and cobwebs). There should ideally be more seating in the living room. For a house that could sleep 15, there is only a sectional big enough for 5 people. Plenty of table seating however. A window in the living room doesn’t close all the way and for some reason. The cold water in the master bathroom smells like sulfur when it’s turned on, which, I was informed it was from the aqueduct. Just seemed odd that it was only in the master bathroom? Overall, great vacation property in an awesome small community.